Tim and Charlie had an unexpected bonus this morning after taking scientists to Grassholm to monitor the gannets. They came across an 8 foot basking shark off the south end of Ramsey as they were calling the office. I’m not sure if Charlie was able to take a photo or not so here’s one from the Venture Jet archive 🙂 . 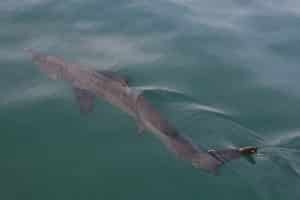 We have a video of a basking shark here swimming quietly alongside the boat. It’s beautiful to watch wildlife when the water is clear under a sunny sky but when basking sharks suddenly seem to arrive out of the gloom on a grey overcast or foggy day they can scare the children 🙂 . The biggest one we’ve seen around Pembrokeshire was probably only about 14 feet long but about 20 years ago when bringing some Ribworker jet boats back from the south coast of England Tim and the others were fortunate enough to see numerous much bigger basking sharks. Perhaps they prefer Cornwall 🙂 .